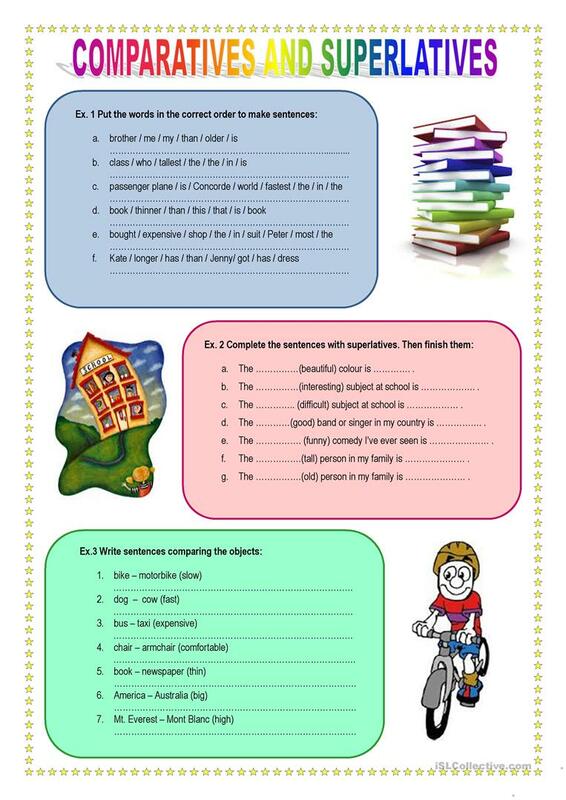 Three tasks for practising comparison. Students write sentences using comparatives and superlatives. The present printable, downloadable handout is meant for high school students and elementary school students at Elementary (A1), Pre-intermediate (A2) and Intermediate (B1) level. It is valuable for teaching Comparison (comparative and superlative) in English. magkam2010 is from/lives in Poland and has been a member of iSLCollective since 2012-11-22 21:26:59. magkam2010 last logged in on 2019-04-25 11:24:56, and has shared 11 resources on iSLCollective so far.